Without Maptimize, your map will be slow or wont even display, UNUSABLE!. We didn't even try to make a real map, it's just a screenshot. With Maptimize everything works perfectly, even with millions of data points. It's very fast. Map is clear and navigation can be done in a few clicks, try it, it's a real map! Maptimize now supports many mapping systems. We already have implemented OpenStreetMap with leaflet, Google Maps and Bing Maps. Our new algorithm can now handle more data than before. 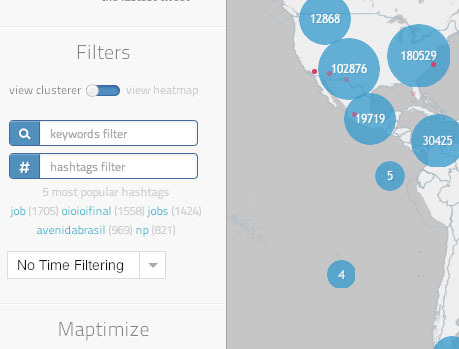 Try our one million tweet map demo. Rendering can be overridden to create your own render. 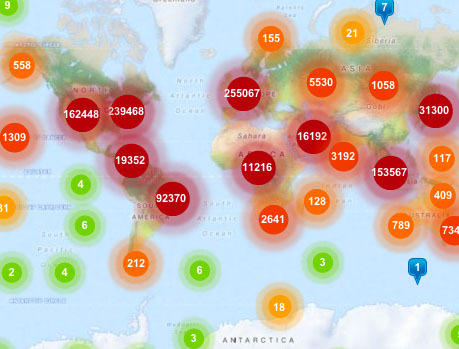 We did a heatmap example for our one million tweet map demo, but it could be a pie chart or anything you want. 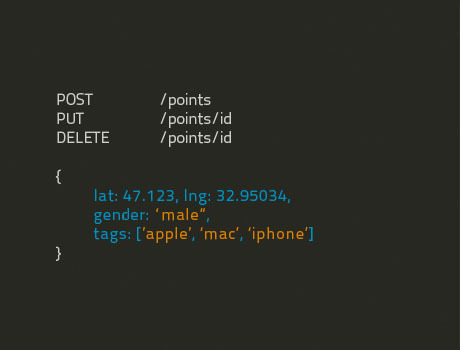 Our REST API lets you create/update/delete a point with instant results on your map. We still support bulk update to initialize your map. We can filter content instantly based on your own criteria! Maptimize has allowed Munzee to grow from a service of 10 markers to a thriving product that has a clustered map of over 130,000 markers. All rights reserved ©2012 | Designed by Magere David.